It sounds like another Whovian thing (or more precisely, Torchwood) (aka “The 456“), but instead, it is a lot simpler than that. 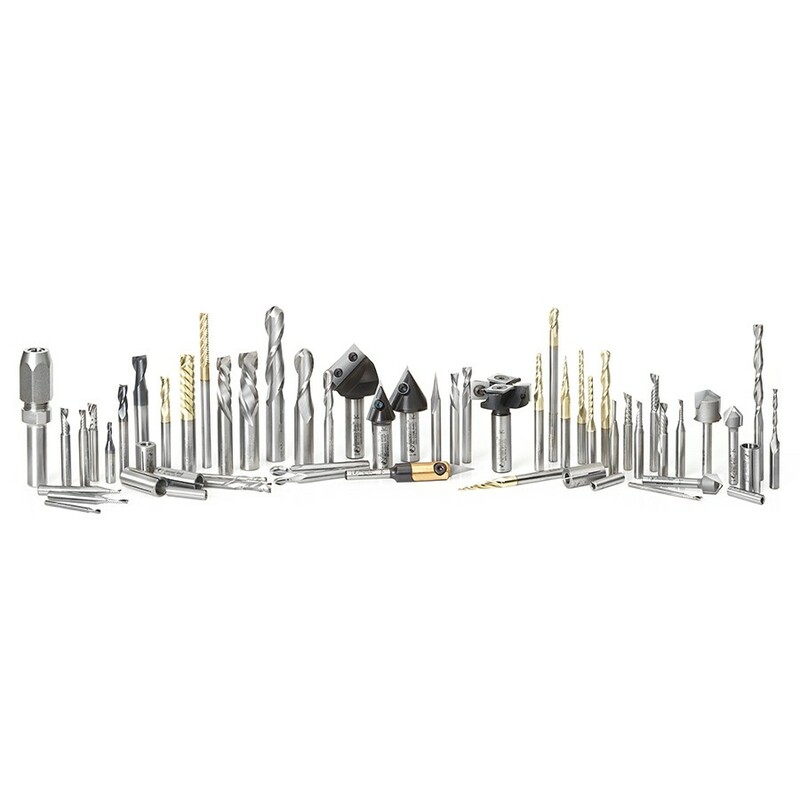 The 45190 is a router bit. For my current activities on the CNC, it is THE router bit. 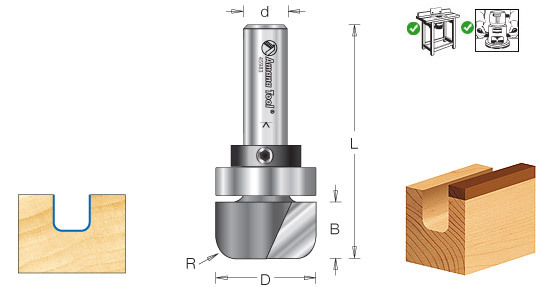 It is not overly complicated – a straight 1/16″ (1.59mm) 2 flute solid carbide cutter embedded in a 1/4″ shank. But it is what I have been able to do with it that sets it apart. Or rather, that it gets done what many other router bits have failed to do. As many would know, I am cutting out a lot of patterns on the CNC, particularly from 3mm thick MDF. To get the level of detail I need, I am using a router bit that is around half that thickness so it can get right into the various corners. But it also needs to do some miles, and that is also where this router bit has been scoring some exceptional goals. I have tried other router bits, with some (but decreased) success – spiral upcut bits work, but have a tendency to pull the resulting piece that has been cut out, right out of the sheet. It can then be thrown or bumped to a point where the router bit plunges through it while cutting another. I’ve even found small pieces that have been cut out subsequently stuck on the router bit, trying their best to emulate a helicopter! Downcut spirals work better, but they still have a problem that the dust they are carrying downwards gets deposited under the sheet, causing it to lift, and in the worse scenarios, to completely detach from the vacuum table. Granted my vacuum table might not be as strong as a commercial one, or may not be able to carry away any sawdust produced so this doesn’t happen. I’ve also tried larger bits (specifically 1/8″), but they do not give the same degree of detail, and the joints are not as tight. So that leaves the 45190. Yes, I have broken a fair few (and am again down to my very last one, that makes me nervous!) but that has always been the result of something other than cutting normally. Forgot to slow the feedrate back to 100% from a previous operation, and the router bit tried to cut 3-4 times faster than I have worked out to be a good speed for my machine for that bit and that material. I’ve hit the clamp on at least one occasion, and a screw on a couple of others. I’ve had a piece come loose and wedge itself against the spinning bit, and it has broken when the CNC moved in that direction. Sadly, I have occasionally forgotten which is Y and which is Z (or have simply clicked the wrong button), and instead of lifting the bit, have tried to drive it through the material. And more than once I’ve had the CNC get its + and – directions confused, and it has driven down hard, rather than up. In spite of all this, when the router bit is treated correctly, it does the energiser bunny thing – it keeps going and going and going. Check out the teeth on the dinosaur (Spinosaurus) and you will see what I mean about retention of detail. Remember that MDF is 3mm thick to give you an idea of scale. The straight cutter is also not the worse solution either. The dust that is produced gets packed into the cut, which helps hold the piece being cut from moving. The top and bottom surfaces stay pretty smooth, and only a very light sand is required. The detail is retained, which is important, and the yield from each sheet is maximised. 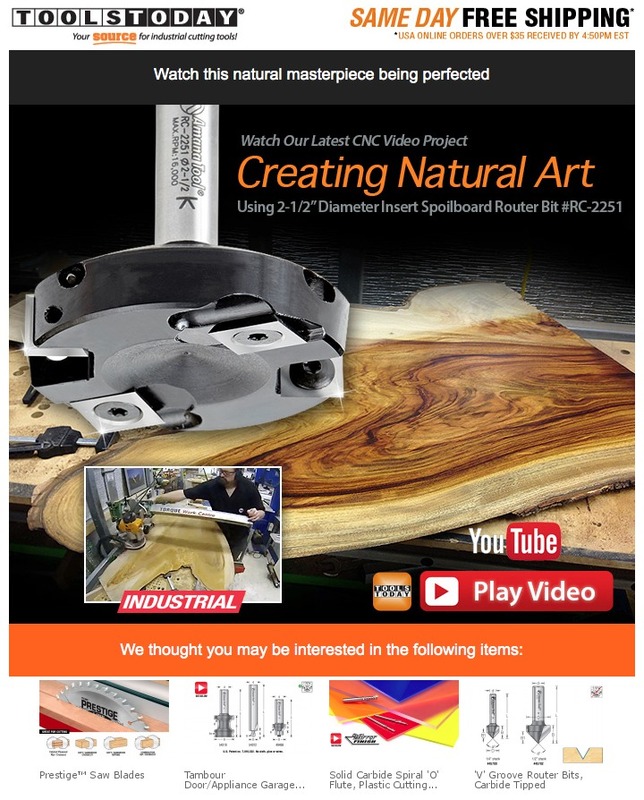 So when I am doing these CNC MDF jobs, and I keep mentioning this one router bit, there is good reason. The 45190. Its a Whovian thing! In the Land of Stu’s Shed where the router bits lie. 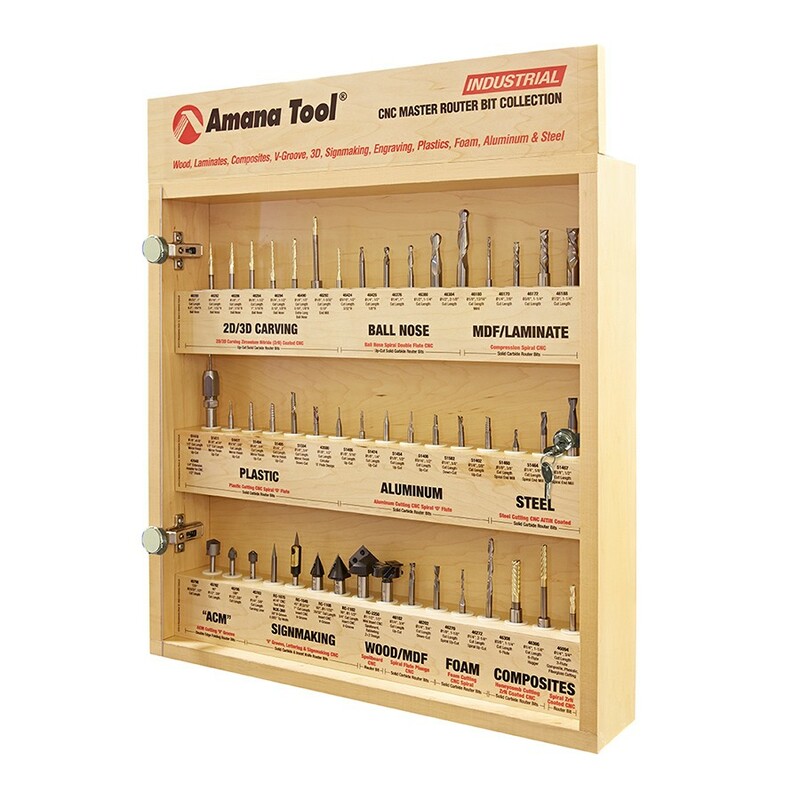 58 CNC router bits in its own display cabinet, for CNC routing timber, MDF, laminate, plastic, aluminium, steel, foam, and composites. That is a set and a half! Check out the next edition of The Shed magazine for a full description and step by step for making this project. Haven’t tried it before, and it was a very interesting exercise. The Amana Tool bit worked out very well – a very nice bit that worked very well, even when shucking off a good amount of material. There was no tendency to kick back either. I won’t pre-empt the article – you’ll just have to read the next edition of “The Shed” magazine!